The holidays can be one of the most wonderful, magical times of the year. But they can also be the most stressful! 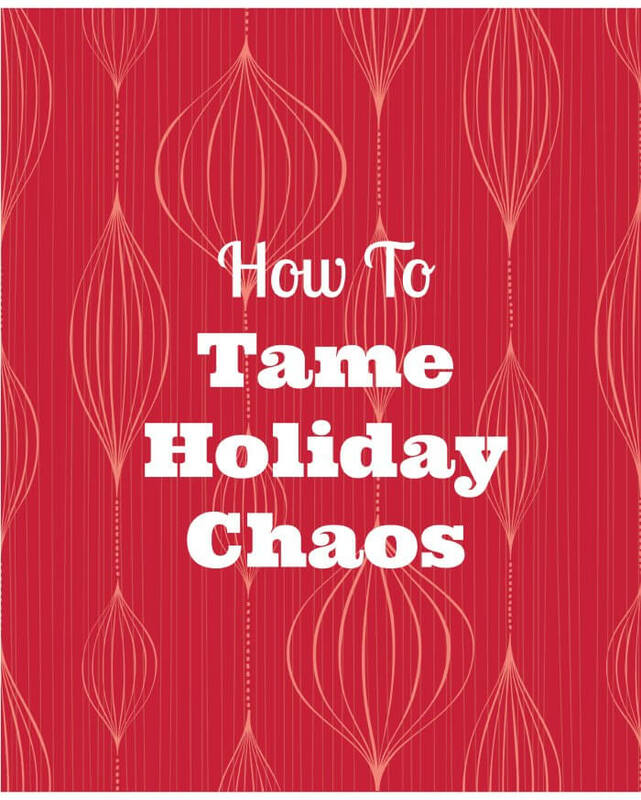 That is why I am so pleased to have Julie Morgenstern, an organizing & productivity consultant, New York Times best-selling author, and speaker to share with us today here best tips for ways to tame the holiday chaos. For over 30 years, Julie has been teaching people all around the world and at all stages of life how to overcome disorganization to achieve their goals. Her newest ventures, the Time to Parent podcast and book, help parents savor time both with their kids and on their own. I hope you tips to tame the holiday chaos help you enjoy what matters most these holidays- family and those you love. Ahhh, the holidays. With visions of sugar plums dancing in our heads, it’s easy to get caught up in trying to live the hallmark vision of the holiday season and miss all the joy we aspire to. We get so stressed over buying the perfect presents, being the perfect host, wearing the perfect outfit, and cooking the perfect meal, that we can’t wait for the holidays to be over. 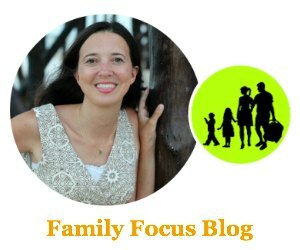 If this sounds like how the holidays typically go for you and your family, this year I challenge you to infuse the season with joy (and humanity) by simplifying your holiday tasks, and freeing your spirit of perfectionism. Define the holidays with your family. Step back with your family and define two or three things that really make the holidays special for your clan. E.g. sending cards, baking, entertaining, decorating, gift shopping, volunteering? Create simple and meaningful traditions around those. Share the workload. Allow each family member to be responsible for planning and implementing the part of the holidays they like best. And, to always be ready for drop-by visitors—make each family member responsible for clutter pick-up in one room of the house throughout the holidays. Lighten up on entertaining. A potluck holiday party is easier to pull together and takes less time and money than a soup to nuts home meal you assemble yourself. Remember the point of these gestures in the first place—it’s a chance to express love, reconnect, or extend social decorum. Decorate in under an hour. Change table linens and runners, switch throw pillows on the sofa and beds, and replace hand towels in the bathrooms to give your home an instant and beautiful holiday spirit. Put orange slices and cinnamon sticks in a pot, bring to a boil and simmer to bring a fresh, festive scent into your home. 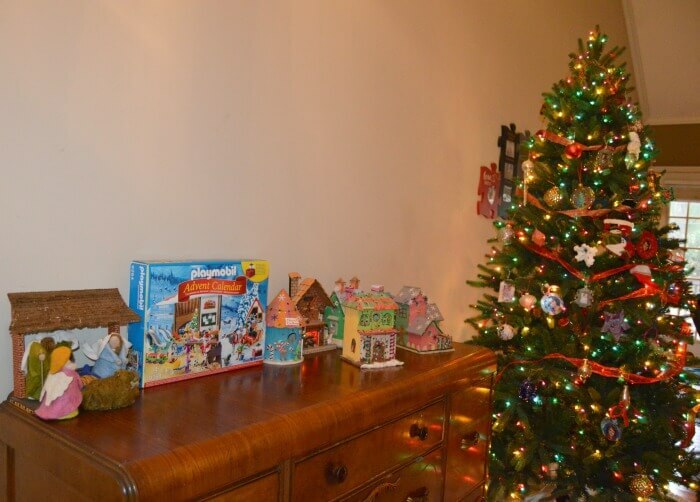 Use your advent calendar as decoration. Minimize shopping. Before you do an ounce of shopping, scour your favorite hiding places for gifts you tucked away (ditto for leftover wrapping paper and ribbons). Chances are you can check off at least 25% of your list immediately. Charge all gifts to one credit card to keep track of expenses. Streamline card sending. Reduce stress by limiting your lists (no need to include every person you’ve ever met), and limiting your sources. Your cell phone directory and email history provide clues to the most important people in your life right now. And, there’s nothing wrong with an e-card or even a holiday message to all your peeps on your fav social media site. Don’t abandon your exercise routine. Enjoy the indulgences, but if you feel yourself getting sluggish, do something physical to restore your energy. Stretch, get yourself to the gym or enjoy a brisk walk after a holiday meal. Put people first. It’s so easy, especially when we’re busy shopping, decorating, and organizing to slip into the habit of doing instead of just being. Remember the goal of the holidays—to create more space for quality connections with family and friends. Sit with your kids every night to hear about their day and stay connected. Short bursts of undivided attention (5-15 minutes) nurture our souls. Trade perfection for presence. If you catch yourself falling into the trap of perfectionism, stop to consider what’s most important: you can obsess over your lemon and pinecone centerpiece OR you can enjoy talking with friends over a glass of wine and cheese, chipped platter and all. 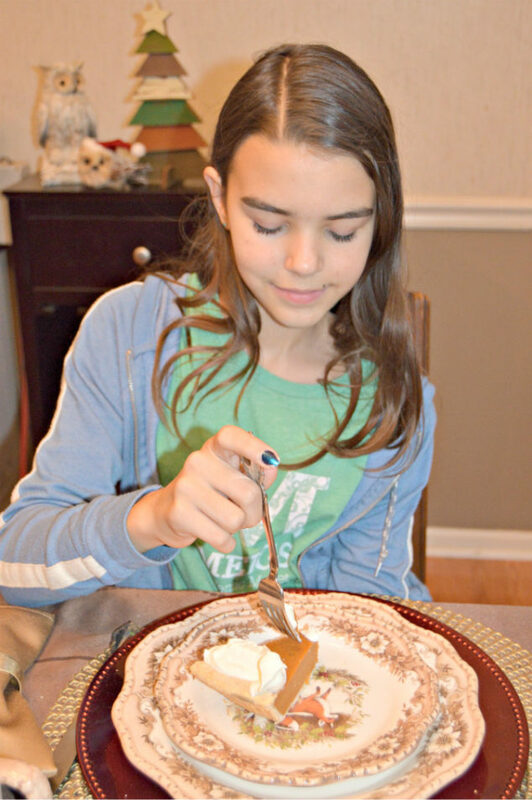 You can bake a pie from scratch with your kids for the school’s holiday party OR you can buy a pie and help your child rehearse lines for the school play. There’s more to the holidays than cards and gifts…it’s a time build relationships and relish the joy of the season. So, keep it simple, leaving yourself enough time to stop and smell the pine trees. If you found these tips helpful, you are sure to enjoy Julie Morgenstern’s new book, Time To Parent (affiliate link below). Happy Holidays! This is such a great post! I love these reminders. I especially love 1 & 8. Our family has become clear on what it is we like or want to do every holiday. I call them “we always”. We always decorate for Christmas after Thanksgiving. We always watch Christmas movies each night as a family. It’s fun. And #8, put people first. It’s easy to get caught up in the “to do lists” and forget what the holiday season is really about. If I find that I’m getting stressed out…I take a pause and a breath and think about the bigger picture. And sometimes not doing every single activity is necessary for sanity sake. Thanks for the post!